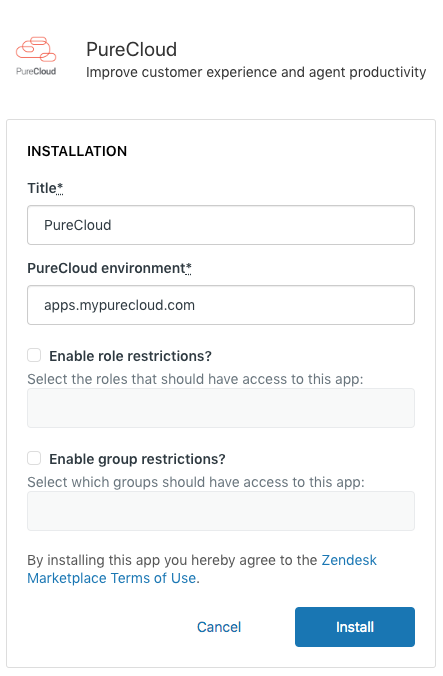 To use the integration, install the PureCloud for Zendesk app from the Zendesk Apps Marketplace and then configure items on the Installation screen. This required field is the name for the app that displays in your Zendesk organization. This required field allows you to change your PureCloud environment to match the location of your PureCloud organization. Modify the URL that appears under PureCloud Environment based on where your PureCloud organization is located. This selection determines whether comments that the integration generates on tickets are public or private. When this selection is enabled (public), these comments are visible to all people, including customers, and are sent to the ticket requester. When this selection is not enabled, these comments are only visible to other agents, and are not emailed to the ticket requester. By default, logs appear in your browser console that you can use to troubleshoot issues. You can also configure PureCloud for Zendesk to save logs server side by selecting Enable server-side logging. Customer Care can then access these logs directly, eliminating the need for you to send them. Note: If you have a slow or unreliable Internet connections, or you risk running out of session storage, we recommend that you do not select Enable server-side logging. This selection allows you to restrict the use of this app to certain roles. After installation, you can change these settings.